This pen is troublemaker. I have had it for a good number of years and as I reflect on it now, I am not exactly sure why. 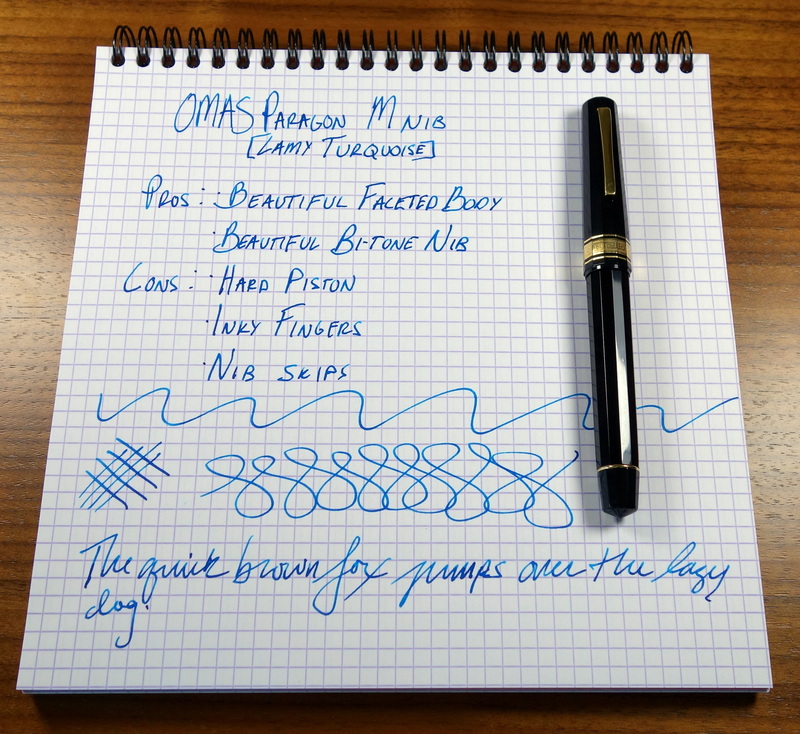 I figure that my first OMAS review should be one that I would consider to be a great first OMAS. Don’t take that to mean that the Paragon is the bottom of the line pen, it’s not, it is in fact the top of line oversized model but used, in black resin, it is quite affordable and a good place to start with the brand if you are willing to roll the dice a bit. For those that do not know, OMAS stands for “Officina Meccanica Armondo Simoni” and they continue to make some of the world’s most beautiful fountain pens. OMAS is famous for their Arte Italiana line that features wonderful faceted pens. The Paragon is the largest model (and consequently the most desirable) in the Arte Italiana line. Barrel Imprints can help identify the approximate age of a Paragon. The Paragon I am reviewing today is from the early 1990s. It differs in a few ways from the current Arte Italiana Paragon which confusingly now has two distinct styles “Vintage” and “Icon”. The “Vintage” style is more or less the same pen they have been making for decades and most closely resembles my 1990s Paragon. The body is made out of black resin and has 12 facets with 18kt gold furniture including Greek key bands on the cap and on the section just above the threading. 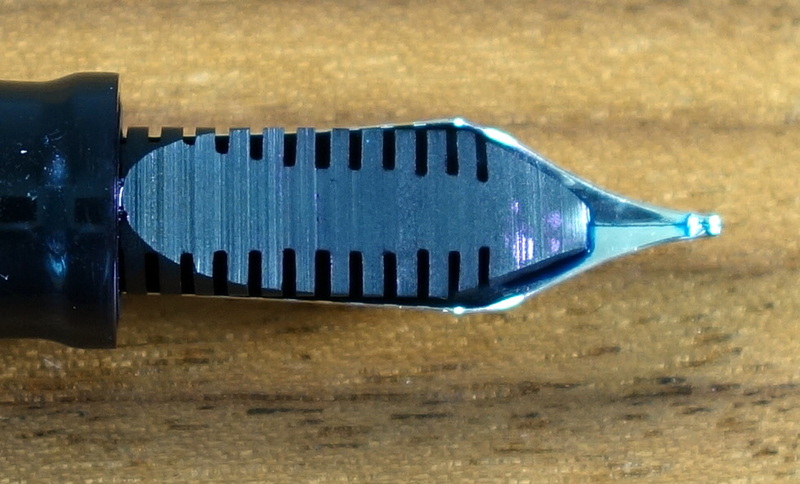 The pen terminates at each end with short points. The large nib is a classic OMAS arrow design that I have seen on OMAS pens as old as the 1930s. 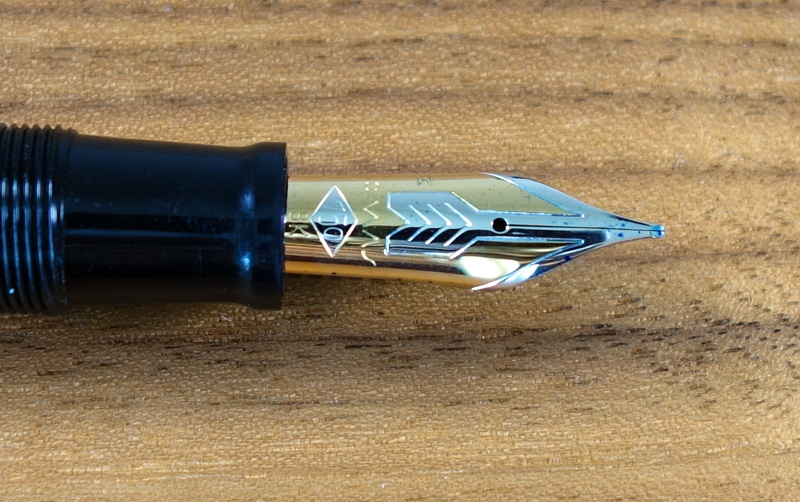 It is one of the best looking nib designs out there. No ifs, ands, or buts about it, this pen is beautiful. I have had the pleasure of owning a few celluloid versions and those really gave my Nakaya a run for its money in the awe department. OMAS pens are turned from a single block of resin or celluloid and just about everything on this pen is done by hand. OMAS made the nib in house and it’s beautiful. Even the hand cut ebonite feed is beautiful. There are no seams and nothing on this pen looks poorly executed BUT there are some functional problems. The piston knob is hard to turn (something I have experienced with all my OMAS pens from the 1980s-2000s purchased new and used). I don’t know if OMAS is trying to cut down on costs by saving on lubricators or what but it seems odd that such an expensive brand would have a hard and rough mechanism. My biggest gripe about this pen is that I get ink all over my fingers when I use it. I believe ink comes out from the nib sleeve and onto the collar of the section. I have sent this pen in for repair where the entire pen was disassembled (piston mechanism lubricated…still hard to twist) and the problem wasn’t solved. This is a beautifully made pen but unfortunately, it just doesn’t work all that well. The Paragon measures 5.6” capped, 5.25” uncapped and a whopping 7.15” posted. My partially full Paragon weighs in at 19.6 grams, which is very comfortable, and lightweight for a pen of this size. I find that the Paragon is comfortable to write with unposted as well as posted, despite its long length. For me the combination of its large size and lightweight make it almost perfect. I am buying more and more old OMAS pens from the 40s and 50s and I always try to opt for the largest size in a series. I did not realize until after I took the picture that the OMAS pictured beside the Montblanc 149 isn’t the 1990s Paragon in all the other pictures…its an older 1960s celluloid version. The size is identical though. Founder Armondo Simoni, believed that writing should be an enjoyable experience and as such pens needed to be lightweight. You wont see any overweight OMAS pens until after he passed in 1958. Interestingly, the Paragon size (also know by the number 557) has changed throughout the years. In the late 40s to early 50s the 557 was over 5.6” and then in the late 50s it dropped to under 5.5” which would have been the senior size (aka the 556) in the late 40s early 50s. Today the Paragon is back to its original extra large size. Up until the mid 1990s OMAS manufactured their own nibs in house before switching over to highly modified Bock nibs. It is clear to me now having owned a several modern OMAS pens with both Bock and OMAS nibs that the change was really quite minor in terms of performance and feel. They both have the same hand cut ebonite feed and the design is mostly the same. 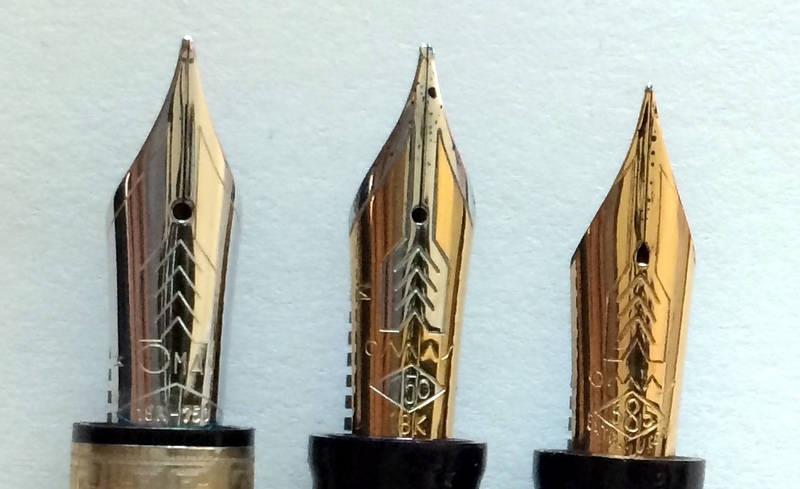 In the 1960s and prior the OMAS made some of the best “semi-flex” (like the 14kt Extra Lucens pictured below) and flex nibs that I have ever used. Below are three different nibs from Paragon-sized OMAS pens. Left to right: 1) Bock made 18kt gold, 2) OMAS made 18kt gold, 3) OMAS made 14kt gold “Extra Lucens” from the 1960s. “OMAS” on a Bock nib has a large “O” and a bit different Greek-style lettering. You cannot see it without removing the nibs but the OMAS made nibs actually have a much longer body than the Bock ones. I don’t think there is any difference from a performance perspective but it is clear that OMAS made nibs are made with more gold. The medium point 18kt gold nib is quite springy and with its generous flow feels quite nice on paper. The nib as long as I have had it skips. I sent it to a well-known nibmeister to be sorted out unfortunately he didn’t fix the problem, it still skips…I suspect that it needs a bit more regrinding. If the nib didn’t skip it would be one of my best nibs on a modern pen…it really feels excellent. 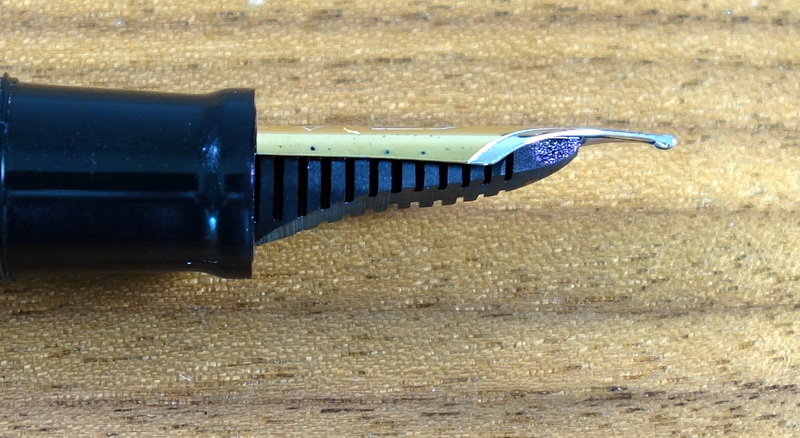 Side view of the Paragon nib. In the end it sort of does everything I don’t want a fountain pen to do… it skips and gets ink on my fingers. The Paragon is a piston-filler and holds a good amount of ink. If you have ever had the displeasure of twisting the piston knob on an “untested” vintage pen only to find that ink has dried inside the pen locking the mechanism then you have a pretty good idea of what it’s like to use the piston on this pen (and sadly most modern OMAS fountain pens). I might be exaggerating a bit but let’s just say it’s not that pleasant. A used resin OMAS Paragon in nice condition can be had for around $200-$250 and honestly it’s a ton of pen for the money IF you get one that works well. My success rate with both new and used OMAS pens from 1980-2005 has been about 60% and I have had more fountain pens from OMAS than any other manufacturer. I know people who have had nothing but great luck with modern OMAS pens so I would encourage any potential buyer to do their own homework and come to their own conclusions. New, you can buy a resin Paragon (or some version of it) for around $600-$700. The beautiful celluloid versions cost around $1,000. This Paragon’s beautiful looks are let down by poor performance. Interesting that the two problems you have with your OMAS—skipping issues and ink leaking onto the collar—are precisely what I love my own OMAS for NOT having. It’s the wettest of my writers, and despite the occasional nib creep with Yama-budo, ink stains firmly where it should—on the nib and nowhere else. And it writes so well! Like a springy whisper gliding across the paper, lightweight and smooth all the way. I got mine new in box, though, and it’s a 2013 OMAS. Maybe they fixed up some of these problems later on? Thank you for your comment. Which model do you have and if it is a piston filler is the mechanism smooth? The last time I bought a new OMAS was mid 2000s so they very well may have fixed the problems. I believe they changed hands again in 2007. OMAS made some of the best pens in my collection and I still buy them. I just don’t have the same expectations with OMAS pens from the 80s forward that I do with say Aurora or Pilot. If you like vintage pens, OMAS made some of the very best nibs in the 1940s-60s and the overall build quality was superb. Unfortunately the piston mechanism is still as stiff as ever. 😦 But everything else is divine. I have one of the LE Extra Lucens—you might have seen pictures of it on Miss Elderberry’s blog (thesebeautifulpens). It’s the modern remake of the earlier Extra Lucens OMAS, with semi-transparent celluloid and a 12-faceted side. I remember seeing a picture of Miss Elderberry’s pen, halfway filled with blue ink swirling magically through the barrel—and fell hopelessly in love at first sight. Oh yes that is a truly stunning pen. In the 30s Aurora, Ancora, OMAS, Columbus, and Montegrappa all made gorgeous faceted celluloid pens but OMAS is the only one that still does it in that original style. At some point I would like to have one of the original Extra Lucens from the 30s or 40s…they aren’t cheap and sell fast so the right opportunity hasn’t presented itself yet.